* Maximum of 15 custom items in a context menu. * Custom items must contain at least one character. * Maximum of 100 characters. * Each caption cannot be the same or it will be ignored. The majority of the code below should look familiar from the disable context menu in AS3, so be sure to have looked at the code from that tutorial. 1. Creates an instance of the ContextMenu class with the variable ‘my_cMenu’. 2. The hideBuilt items method hide the existing default items in the context menu. 3. 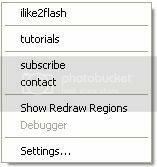 Creates a contextMenu item with the caption ‘ilike2flash’. 4. Adds contextMenu item to the array. 5. This sets the item to the context menu which will disable the custom caption. Test your custom context menu Ctrl + Enter and you should see the following when you right click on the stage. * separatorBefore – This specifies whether a separator bar should appear above a menu item. The default value is false. * Visible – This specifies whether the context item is visible. The default value is false. * Enabled – This specifies whether the context menu will be disabled or enabled. The default value is true. You should get the following custom menu below. Try experimenting with the visible and enable properties. Checkout Custom context menu part 2 for adding custom context menu to a sprite/movie clip object, and adding link functionality.